Exiled with them, the disgraced Bell! To punish it for sounding the alarm. the ear, they cut off its Ear. They cut out its bronze Tongue. Took twelve lashes of the whip! Welcome back to my review of this piece from Argumenty I Fakty. 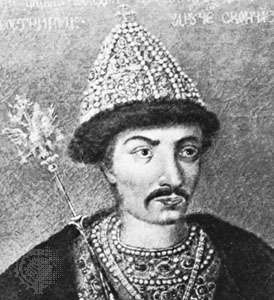 Where we left off in our story and, trust me, this bloody murder mystery is as good as it gets: After the death of Tsar Ivan IV, Terrible’s youngest son, Dmitry Ivanovich, was sent away from Moscow, along with his mom, Maria Nagaya, to live in the town of Uglich. 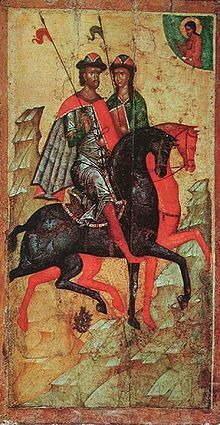 Ivan’s idiot son Fedor (Dmitry’s half-brother, the son of a different mother) had ascended the throne, under the guidance of the powerful boyar, Boris Godunov. Fedor appointed his little half-brother Dmitry to be a regional prince (Russian “kn’az“), the last regional prince of Russia, as it turns out. Boris and Gleb: The poster children for why Russia needs a centralized government. Connoisseurs of Russian history know by heart the chronicles of the Russian princes and their various feuds. Primogeniture was not practiced in Russia in the Middle Ages. Rather, it was the custom for each son of a prince to get his own little territory. This led to squabbles, family feuds, and inter-clan wars. A situation highly lamented by the anonymous author of Russia’s national poem, “The Story of Igor’s Regiment”. The disarray of Russia’s ruling class made Russian towns more vulnerable to conquest by aggressive hordes arriving from East or West. The only solution to this problem of chronic invasion, was more centralization of authority, the establishment of a more “Vertical” system of government. Only in this way could a solid Russian army be constructed that was more interested in fighting external enemies, than in backing some prince trying to kill some other half-blood prince. The centuries flew by, a lot of history happened, and eventually the Prince of Moscow became the Grand Prince of Moscow (higher than the other princes), and then eventually clawed his way up to actual Caesar (Tsar of all Rus). This process was almost complete by the time that Dmitry Ivanovich was born. This little tyke never really had a chance at governing anything other than his own wardrobe. Even if he weren’t a toddler at the time, Prince Dmitry’s authority would have been severely limited. With the spread of the “Vertical Power” model, the de facto Governor of Uglich was a man named Mikhail Bityagovsky, who goes down in Russian history as either a perp or a vic, depending on one’s historical beliefs. Bityagovsky was appointed to his post by Boris Godunov. Some say that Boris was an enlightened ruler who improved the Russian economy and implemented needed reforms. Others say that he was a child-murderer. The poet Pushkin agreed with the latter crew. And the poet Pushkin “is our everything”, according to Stalin, therefore his theory must be correct! Or not…. Anyhow, Boris appointed Bityagovsky to the important Uglich post. Of which, apparently, Bityagovsky made a hash of things and ended up stone cold dead. His title was Дьяк (“diak”), from the Greek διάκονος (“diakonos”, “servant”, as in English “deacon”). The Russian wiki defines the “diak” as a government official, often drawn from the ranks of the lower nobility. Not being of the higher clans of boyars, these officials operated outside the elite feuds and directed their loyalty exclusively to the Tsar of all Rus. The murder of the child took place on 15 May 1591. Dmitry was stabbed (or accidentally stabbed himself, depending on whom you believe) in front of the church. According to legend, the bell ringer witnessed the murder from up in his bell tower and started ringing the bell like crazy to sound the alarm. Responding to the alarm, the people of Uglich rushed to the square and started massacring everybody whom they suspected of being involved in the boy’s death. Arriving at the square in short order, Mikhail Bityagovsky tried to reason with the mob, then ordered them to cease and desist. They responded by pelting him with stones and killing his son Daniil. 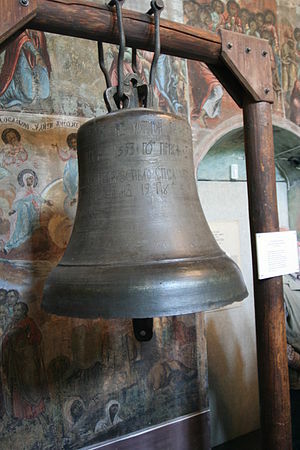 Bityagovsky ineffectually ordered the bell-ringer to stop ringing the bell. The latter refused, locked the doors to the church, and kept on ringing. 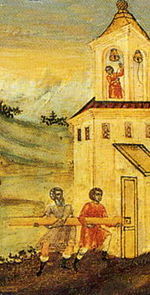 Bityagovsky and his remaining male relatives grabbed a wooden ram and tried to break through the doors to the church, as is depicted in the famous fresco. Still, the bell-ringer refused to desist. Meanwhile, the Uglich mob tore apart numerous people, including Dmitry’s own nanny, Vasilisa Volokhova, whom they suspected of being part of the conspiracy. Allegedly Vasilisa had given the child the necklace and told him to go out and play on the square in front of the church, thus setting him up for the assassins. The backstory here is that the people of Uglich were extremely loyal to Dmitry, and to the entire Nagaya clan. They regarded it as their sworn duty to protect the Tsarevich from Fedor and Boris in Moscow. Having failed in that duty, they took it upon themselves to dispense street justice to the alleged perps and their accomplices. Realizing that he couldn’t reason with these people, Bityagovsky tried to save himself by hiding in the courtyard. But the mob caught up with him and ripped him apart. This was a classic case of the Russian “bunt”, a violent and uncoordinated act of rebellion against the central government! Next, the Russian central government, headed by Boris Godunov, dealt with this regional disruption the way Russian central governments always do… Many citizens of Uglich were violently punished in the ensuing reprisals. Well, and what can you expect? This mob tore apart their own Governor! Still, the punishment may have exceeded the crime. And resentment and bitterness against Moscow remains among the people of Uglich, yea even unto our latter days! To head the reprisal team, Boris Godunov dispatched his trusted executioner, Prince Vasily Shuisky. After an “impartial” investigation of the incident, Shuisky ordered the execution of 200 townspeople; and also dispatched 60 entire families into exile, to Siberia. But then Shuisky went too far: He decided to punish the Bell itself! The church bell was put on trial and convicted of being a troublemaker. As public punishment, the bell had its tongue removed, was given 12 lashes with the whip, and was then also exiled to Siberia. Central government thus sending a message to the provinces: Don’t mess with Moscow! Chroniclers record that, as a final act of defiance (or maybe they were just forced to), the exiled people of Uglich carried the bell all the way to Siberia on their own backs! This entry was posted in Russian History, True Crime and tagged Dmitry Ivanovich, Ivan the Terrible, Maria Nagaya, Mikhail Bityagovsky. Bookmark the permalink.